In QGIS, is there a way to "pin" labels and features from a lower zoom level so that they appear higher up? For instance, considering a map of the US, it would be impossibly cluttered to show every local road and town on a national scale. What if for instance, I wanted to take a specific road and the cities along it, and pin their labels such that these few features appeared even on a national scale? 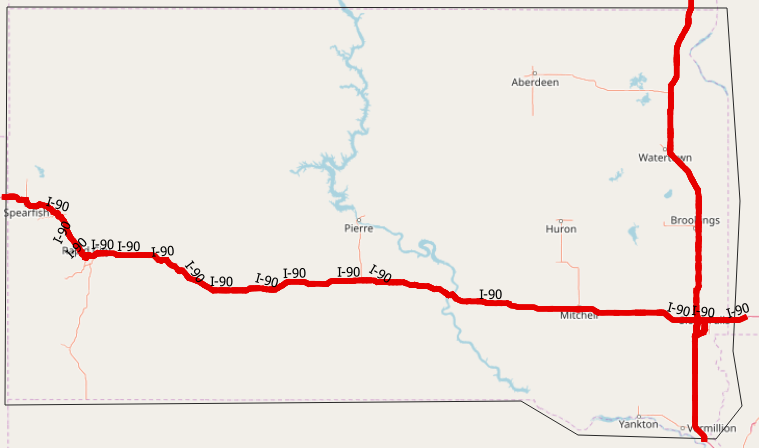 For example, could I take the section of I90 that runs through South Dakota and ensure that it and each town along the road appeared at all zoom levels? I'm using QuickMapServices for base maps, but suspect this is something that can be done more generally if at all. Basemaps obtained through the QuickMapServices plugin are WMS (Web Map Service) layers. With a WMS layer, what you see is what you get. You don't have any control over individual labels and features. A WFS (Web Feature Service) layer, on the other hand, allows you to access and manipulate features and labels through queries. See this page for more info on the difference between WMS and WFS layers. In order to control individual labels, you need the data either as a vector layer, or as a WFS layer. The national map viewer provides several WFS layers. Transportation, govunits and geonames are probably the ones you want. See QGIS Training Manual, 11.2. Lesson: Web Feature Services for instructions on adding a WFS layer. 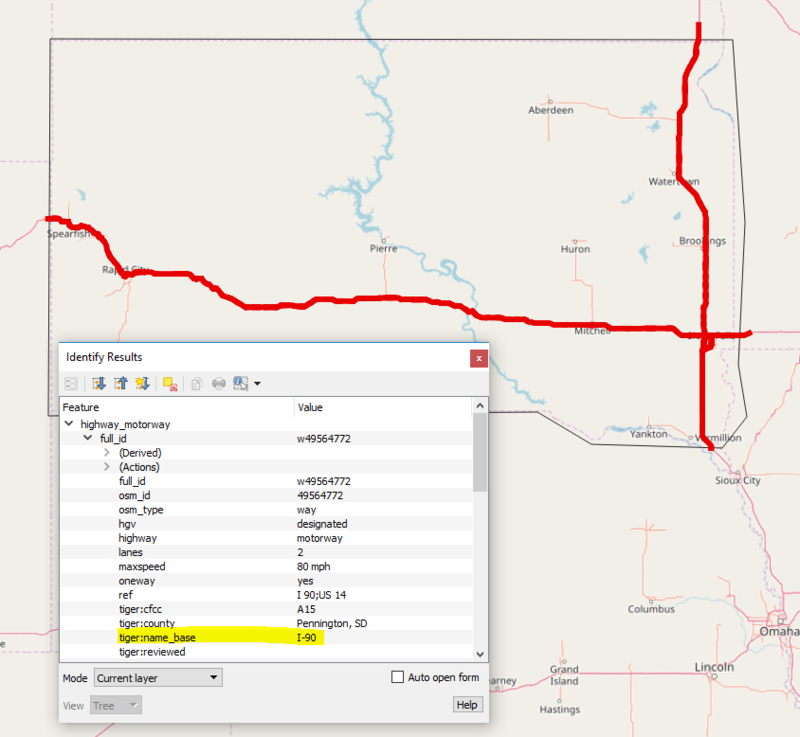 Or you can download individual features (such as sections of I-90 in North Dakota) from Open Street Map with the QuickOSM or OSMDownloader plugin. Zoom to South Dakota on your map canvas. Open QuickOSM. 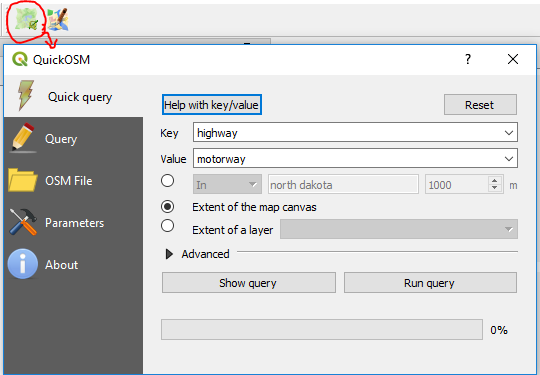 Key: highway; Value: motorway; choose "Extent of the map canvas"
Alternatively, draw a polygon around your area of interest and use the extent of that layer instead of the extent of the canvas. By using the Identify tool, we can see that the name of the highway is stored in a field called "tiger:name_base". Now we can set up a rule-based label so that only the I-90 highway portions are labeled. Type "tiger:name_base" in the text box next to "Label with". One of the best features of QGIS is layer styling and labeling. You really have a lot of control over how your features are displayed and labeled. See QGIS Training Manual, 4.2. Lesson: The Label Tool for more information on customizing labels. To add labels for towns along I-90, decide how wide an area you want to include. Buffer the I-90 highway line by that amount. Use the buffer as the extent for a QuickOSM query of cities, towns, villages etc. Not the answer you're looking for? Browse other questions tagged qgis labeling zoom quickmapservices or ask your own question. 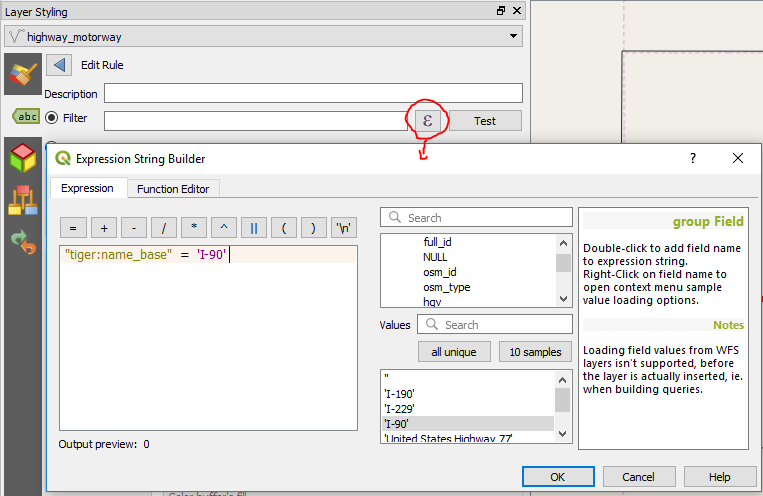 Can I change the precedence when combining “Control feature rendering order” with QGIS symbol levels? Generating map tile for ol.source.xyz?